Mr Sewa Singh Mandla (89), a high profile lawyer and a community and inter-faith leader in Birmingham has been appointed Officer of British Empire (OBE) in recognition of his 50 years’ legal, human rights and selfless community voluntary service in West Midlands. As a long serving volunteer at the Guru Nanak Nishkam Sewak Jatha (GNNSJ) and a trustee at the Nishkam Civic Association Handsworth, Birmingham, Mr Mandla has been recognised for his significant contribution to community and inter-faith development work in the city and the region. He has been able to successfully fuse his professional work in law with spirituality to make a difference to Sikh and wider communities in the UK. Mr Mandla’s perseverance to take the issue of turbans worn by Sikh pupils in schools is a testament of his dedication to fight for a just cause. His presence and strong personality enables him to successfully complete challenging social and professional tasks and projects. Mr Mandla has a gift of mobilising volunteers who are prepared to make selfless contribution to many different projects that he has initiated or led on behalf of other organisations. He has an extraordinary passion and flair for serving the community in the pursuit of making a difference. His perseverance to follow through projects and tasks is one of his outstanding qualities. Mr Mandla is regularly invited to represent the views of the Sikh community in the media. He also volunteers to host television programmes on health and wellbeing and Kirtan on Sikh TV channels. On being awarded the OBE in the Queen’s 90th birthday Honours list, Mr Mandla said “I am greatly humbled and feel privileged to be receiving this honour from HM the Queen. I thank Almighty God for this blessing and my spiritual master, Bhai Sahib Ji whose guidance has never failed me. Guru Nanak Nishkam Sewak Jatha (GNNSJ) invites all communities to un ite in prayers for peace during the festive season. The organisation has facilitated and organised eleven day prayer services for the benefit of all humanity twice every year since 1976. This year is even more poigniant in light of recent events carried out by misguided people in the name of faith. Guru Nanak Nishkam Sewak Jatha, literally means ‘A body of people, dedicated to selfless service, in the name of Guru Nanak Dev Ji, the founder of the Sikh Dharam’ (faith). The humble endeavour is to practice and promote Dharam and optimism through selfless service for the welfare of all. The word Nishkam means being committed to the practice of selflessness – going beyond oneself to unlock infinite potential to do more for the common good. Nishkam sewa can be described as the practice of voluntary service, without expectation of either monetary or even spiritual gain, as well as selflessly helping and providing benevolence to the needy. known affectionately as Baba Ji, founded GNNSJ in East Africa during the 1940s. Baba Ji’s left for their heavenly abode in 1983 and their successor, another blessed soul, Bhai Sahib Bhai Norang Singh embraced and continued the Nishkam legacy in the early 1980’s. From these beginnings, GNNSJ has become a recognised faith based organisation with Gurudwaras in the UK, India and Kenya. It has an estimated one million members worldwide, and since 1995 has been guided by its present Spiritual Leader and Chairman, Bhai Sahib, Bhai (Dr) Mohinder Singh Ahluwalia. With almost 40 years of spiritual development and enrichment, the Gurudwara on Soho Road, Handsworth (Sikh place of worship) is at the heart and soul of GNNSJ’s activities. The Gurudwara started from humble beginnings as two houses previously Polish club on Soho Road in 1976. Following a concerted community effort redevelopment and refurbishment by devotees, the Gurudwara opened in 1977. The area has lovingly been regenerated and many refer to it as ‘the gateway to Soho Road’. GNNSJ has made a commitment and pledge to the inner-city area of Handsworth in an effort to uplift and regenerate the locality and also the people that reside within it. This cannot simply be done through bricks and mortar, albeit this is financially a big investment and requirement, GNNSJ has invested and lead in social capital, volunteers, civic renewal, education, capacity building, relationship building and holding civil partners to account for their actions. As a recognised trusted ambassador for the locality GNNSJ is able represent, liaise and negotiate on behalf of the local population through its facets in the Nishkam group of organisations. Since 1976, prayers have continuously been read each day within the Gurudwara, and specifically, prayers for world peace have been held bi-annually. The Sampat Akhand Path is 11 days in length, consisting of the continuous reading of Sri Guru Granth Sahib Ji, the Sikh eternal revered living timeless Guru and scriptures. Sri Guru Granth Sahib Ji takes approximately 48 hours to complete when read continuously. The Sampat shabad, a specific verse taken from the scriptures, is read in between each line or sentence. This shabad metaphorically acts as a priceless box, encasing each verse of Sri Guru Granth Sahib Ji, allowing us to absorb its meaning and essence. believe that humanitarian work can be done in many ways, but specifically by invoking God’s blessings. The bi-annual prayers were initiated by GNNSJ’s founder and spiritual leader, Sant Baba Puran Singh Ji and are held at the end of July and in December, just before the New Year. These are times when most of the community can come together because of school holidays and the annual festive holidays. In Sikh history the month of December is notable for the many sacrifices and martyrdoms that occurred on behalf of righteousness and faith. So this is a period of reflection and remembrance for the 27 million Sikhs worldwide. The reading and service of Guru Granth Sahib Ji in the Darbar Sahib (Guru’s Court/prayer hall) requires approximately 800 volunteer hours. This does not include all the regular volunteers that help to maintain, run and support the Gurudwara’s other activities. For example, the volunteers needed for langar (free kitchen where blessed food is freshly prepared and served) where approximately 25,000 meals are served every week. greater cohesion and not be seen as a defining or differentiating barrier. 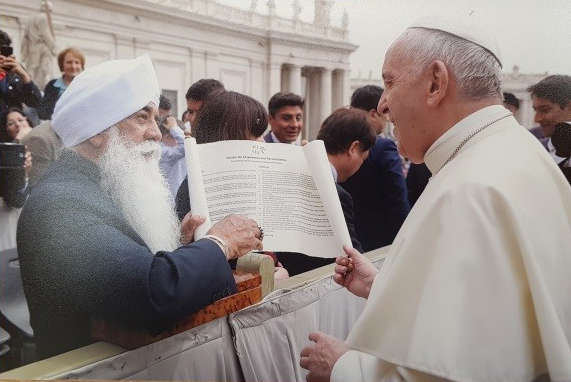 A very significant and relevant project that Bhai Sahib Mohinder Singh is currently leading on is the Museum of World’s Religions which will bring together in one place all the major faiths of the world. Currently, there is one museum of this type in Taipei and an international group of trustees is now working on a similar project in Birmingham. The project will be an opportunity to celebrate differences whilst promoting cohesion, unity, sacred space, values, sacred text and learnings, cultures and heritage. Bhai Sahib Ji, the third in line of Sikh religious leaders of GNNSJ and since 1995, Chairman of the Nishkam Group of Organisations, is active in religious practice and propagation; social regeneration; heritage conservation; education, health and infrastructure development. He is passionate about empowering individuals and organisations with common religious values, through selfless service, education and exposure. · Spearheading the upgrading of the Holy Takhat of Patna. This is the birthplace of the Tenth Guru of the Sikhs, Guru Gobind Singh Ji (1666) and for the 350th anniversary several million pilgrims are expected from Oct 2016 – Jan 2017 for which preparations are being made. • Working on international peace initiatives as one of fifty co-presidents and trustees of Religions for Peace (RfP) International. The Nishkam Civic Association, or Nishkam Centre as it is lovingly referred to, is the civic and engagement arm of GNNSJ and both organisations welcome members of all faiths, or traditions, all persuasions, and all backgrounds to come and see first-hand what the Nishkam Group of organisations and the Sikh community here in Birmingham is doing. To this end, if any organisation, individual or group of people wish to visit please contact the Nishkam Centre or GNNSJ directly on the following email addresses info@ncauk.org or visitors@gnnsj.org. On Thursday 20th November the Nishkam Centre was honoured to host a multi-faith event, Prayers in Harmony, to mark Interfaith Week 2015. It also served as show of solidarity with the recent Paris events and the other atrocities around the world. to know someone new. Conversations became increasingly enthusiastic as people found common ground and related to one another on a more personal level. Chairs were set in cabaret style creating a welcoming atmosphere allowing conversations to flow.In the midst of a cold and windy Thursday morning, people from various faiths and none, gathered to spread warmth and love. 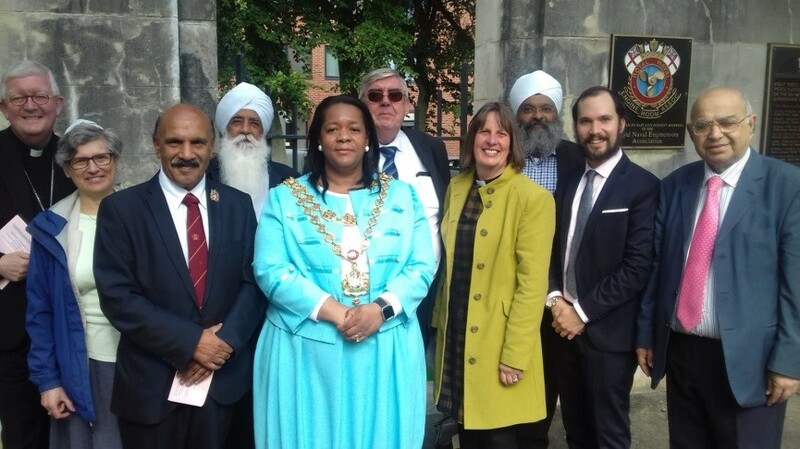 Many people from the local community, as well as some dedicated faith leaders, came to reflect on the collective meaning of prayer with the aim of bringing the city’s major faiths religions even closer together. All the guests were then invited into the Heritage Centre to view the specially resurrected the Sound & Silence Exhibition which had previously been on display at the Birmingham Museum and Art Gallery. The exhibition highlighted the 24 Moral and Spiritual Dispositions, which were created by the Standing Advisory Committee on Religious Education (SACRE). the City Council and teachers’ unions, who come together to develop and monitor the implementation of the Religious Education (RE) syllabus across the city. The curriculum arising from Birmingham’s RE syllabus is designed to help pupils investigate twenty-four key ‘dispositions’ agreed by all of the city’s faiths. These ‘dispositions’, or qualities, are the goals of successful teaching of the RE syllabus. Once the guests had viewed the exhibition, which also included an impressive model replica of the Harmandir Sahib (Amritsar, India) (referred to by many as the ‘Golden Temple’) they took their seats for the next phase of the day. A representative from each faith tradition was invited to share a prayer, reflection or a story in relation to their faith. Islamic, Christian, Quaker, Catholic, Jewish, Buddhist and Sikh stories, prayers and reflections were shared and enjoyed by all. A beautiful violin piece was played by Rabbi Dr Lior Kaminestsky. Dr. Andrew Smith, the Bishop of Birmingham’s Director of Inter-faith Relations said, “For many Christians prayer is about entering in to the presence of God and the Father”. “God is everywhere, every place that you allow him to come in. And prayer is one of the ways to let God come into our hearts” echoed Rabbi Lior Kaminetsky from the Jewish community. Arvinder Jain from the Jain faith said that every human being has the potential to become God in essence we could all be a ‘the liberated soul’. “You don’t find anything about prayer or meditation in books. Only when you practice you find out what it’s all about” iterated Yann Lovelock from the Buddhist tradition. “Islam itself linguistically, means peace, but also submission to God; submission to the ultimate reality which is God. And that’s the whole point of Prayer; prayer is submission and directing your heart to God.” said Shoaib Hafiz from the Islam faith. There were many laughs and even a few tears as the various reflections touched the hearts of all who attended. Thanks and gratitude were exchanged and a feeling of spiritual bliss was left in the air. The Prayer Exhibition will be available to view by appointment at the Nishkam Centre, and many Interfaith Events are to be implemented in the future. On Tuesday 10th November, Archbishop Michael Fitzgerald visited the Gurudwara served by Guru Nanak Nishkam Sewak Jatha (GNNSJ) and the Nishkam Centre as part of his trip to Birmingham. The visit was a session following the Archbishop’s first visit to the Nishkam Group of Organisations in 2000.
visit. The Archbishop was welcomed on behalf of Bhai Sahib Bhai Mohinder Singh by a delegation from the Nishkam Education Trust and Nishkam Centre. Local members of the Focolare Movement were also invited because of creative partnership working they were developing with the Nishkam Education Trust. Until his retirement in 2012 the Archbishop was the Papal Nuncio to Egypt (envoy or permanent diplomatic representative of the Holy See to a state or international organisation) and delegate to the Arab League. A strong advocate of interreligious dialogue, he is widely considered the Catholic Church’s leading expert on Islam. On the Monday evening preceding the visit, Archbishop Fitzgerald was welcomed by faith colleagues from various members of the city’s faith communities at St Chads. Archbishop Bernard Longley hosted the evening and Archbishop Fitzgerald had the opportunity to have informal conversations with all present. The Archbishop also gave an address to Catholic colleagues at St Chads. During talks the Archbishop said, “The more you understand a religion, the better it is. I think this helps to build relations”. The Archbishop on arrival went to the Main Darbar Sahib and presented a bouquet of flowers to Guru Granth Sahib Ji. The entourage then proceeded to the rooftop Gumbad Darbar (Dome prayer room) and listened to the evening simran (prayers) being recited. On route to the rooftop Darbar the group walked past the Langar (free food prepared and served from the Guru’s Kitchen by volunteers). The Archbishop was struck by the amount of food that was prepared and served to people visiting the Gurudwara and also the Nishkam Help meals that go out to feed the homeless in Birmingham. holiest city of Amritsar in Punjab (India). Whilst underlining that he was not directly responsible for enabling such developments Archbishop Fitzgerald said would welcome and support the opportunity for dialogue. Amrick went on, “Unfortunately, Bhai Sahib Bhai (Dr) Mohinder Singh OBE could not be present to welcome and host the Archbishop in Birmingham due to a conference engagement at Lambeth Palace. However, Bhai Sahib and the Archbishop will have an opportunity for discussion tomorrow in London”.